The heart is nourished by oxygen-rich blood provided by the coronary arteries. When you have coronary artery disease, the arteries become narrow, causing problems with blood flow. Plaque builds up in the arteries, and if it is hard, it ruptures. Platelets arrive in the area and form blood clots around the plaque. However, if a blood clot blocks an artery, the heart muscle is starved, and heart muscle cells die, causing permanent damage in the form of a heart attack. If you suffer a heart attack on the job, the Boston workers’ compensation attorneys at Pulgini & Norton are available to help you pursue benefits. In Massachusetts, you can potentially recover workers' compensation benefits if you suffer a job-related injury or illness. An injury is considered work-related only if an aspect of the job causes it. You will need a doctor's opinion that the injury is work-related to prove your case, and this may be more challenging with a heart attack than with a fracture or repetitive stress injury, for example. Some possible work-related triggers are prolonged physical activity that is part of the job, exposure to environmental toxins, or emotional stress or excitement. If any of these is the cause of the heart attack, the insurer may try to avoid paying the claim by looking for other reasons you may have suffered a heart attack, including a pre-existing condition. Many workers mistakenly believe that a medical condition or injury that started before employment is never compensable. However, a pre-existing injury or medical condition does not bar you from recovering benefits if your new work-related injury is a major cause of a disability or a need for medical care. 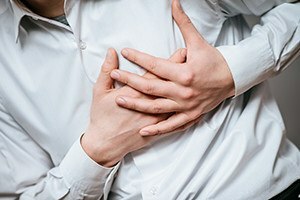 The law requires your employer to accept you as you are, so if some aspect of your job aggravates a pre-existing heart condition, resulting in a heart attack that keeps you from working, the entire disability will be considered work-related for the purposes of workers' compensation benefits. The work-related injury need not even be a predominant cause of your inability to work or need to go to the doctor. The insurer may also focus on any risk factors that you may have, such as smoking or obesity. Again, these are not necessarily valid reasons to deny your claim. You should not assume that the insurer's inquiry into your health history means that you are not entitled to benefits. Often, heart attacks are caused by multiple factors, but as long as your attorney and you are able to establish that your work was a major cause, you should be able to recover benefits. What if a heart attack happens somewhere other than work, such as during your off-hours or over the weekend? In that case, you will likely need to establish that your symptoms began at work and continued away from work, culminating in a heart attack. If you suffer a heart attack on the job, you will need medical care and time to recover. In many cases, insurers may deny a claim because of a pre-existing heart condition, high blood pressure, obesity, or other risk factors. Retaining a Boston workers' compensation lawyer to fight for the full range of benefits to which you may be entitled can be crucial. At Pulgini & Norton, our work injury attorneys represent workers' compensation claimants in Cambridge, Andover, and Weymouth, among other Massachusetts communities. Contact Pulgini & Norton at 781-843-2200 or through our online form for a free consultation.